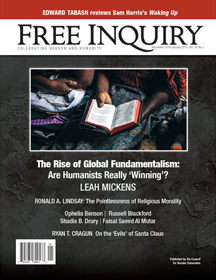 The Rise of Global Fundamentalism: Are Humanists Really ‘Winning’? Adherence to scientism has been repaying handsomely, economically as well as culturally, whereas betting on anti-scientistic dogmas threatens the growth of knowledge. Honest atheism is not tragic, but for some it’s genuinely frightening. The answer is more honesty. Modern statistics could not have taken shape without the prior discovery of evolution, which helped legitimize and secularize randomness. Appeals to God cannot settle ethical dilemmas. God can’t tell us what to do; we need to figure that out for ourselves. A look back at thirty years of skipping Christmas and at how things are different now. Considering the wonders that science reveals, why does anyone need the supernatural? It’s all obvious and predictable enough: of course high status tends to confer immunity from the social pressure and sanctions that keep the rest of us in line. Civility is valuable, yet not so much so that the state—or a university—can properly require it. Western liberals underestimate the extent to which, in the Arab world, Islamic extremism is a mainstream phenomenon. A libertarian opposed to most government programs wrestles with his enjoyment of the programs he likes. Letters from Free Inquiry volume 35, issue 1. Overpopulation was the cause of Rwanda’s 1994 genocide, which the world has largely overlooked. For believers, C. S. Lewis proves that a Christian commitment is intellectually defensible. But it turns out there is precious little that is intellectual about Lewis’s own journey to Christian belief. I’m an Atheist. Can I Be President? An atheist prep-school student wonders whether his unbelief will stunt his future. Santa Claus is described in many stories as knowing whether children are “naughty or nice.” This is bothersome for two reasons. Victor J. Stenger, a physicist and the author of many popular books on atheism and science, died on August 27, 2014, at the age of seventy-nine. A review of Waking Up: A Guide to Spirituality Without Religion, by Sam Harris. A review of The Soul of the World, by Roger Scruton. A review of Atheist Awakening: Secular Activism and Community in America, by Richard Cimino and Christopher Smith. The poem from the December 2014/January 2015 issue of Free Inquiry.